What is a rainbow? How many are there? Why is the sky blue? Why is the setting sun red and flattened? What is a mirage? Why are there rays or spokes coming from the setting sun? What is the green flash? Can it be photographed? Why does the moon look so big on the horizon? Why do stars twinkle? What is an aurora borealis? Is it really darkest before dawn? Why are wet spots dark? What is that ring around the Sun? Why can water appear so many different colors? These and dozens of other questions about naturally occurring optical effects are explained with pictures and diagrams, along with tips on how to see and photograph them. Authors David K. Lynch and William Livingston are astronomers. One of Choice's Outstanding Academic Books for 1996. This is a collection of SCIENTIFIC AMERICAN articles. 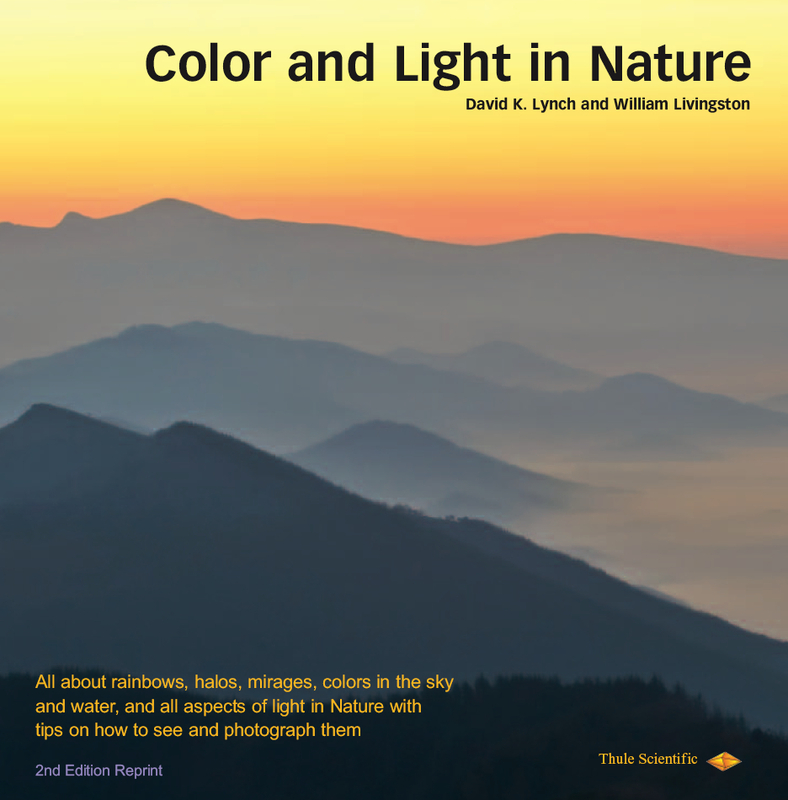 Editor David K. Lynch writes an introduction followed by reproductions of the original articles by various authors: WATER, ICE, SNOW CRYSTALS, THE GROWTH OF SNOW CRYSTALS, HAILSTONES, FOG, THEORY OF THE RAINBOW, THE GLORY, MIRAGES, THE GREEN FLASH, MECHANISM OF LIGHTNING, BALL LIGHTNING, THUNDER, ATMOSPHERIC HALOS, NOCTILUCENT CLOUDS, THE AURORA, THE AIRGLOW, THE ZODIACAL LIGHT. The articles predate 1980 and are a little out of date, but this remains one of the best surveys in the field - if you can find it: it's long out of print.